Daniel Ricciardo (right) celebrates his pole with David Coulthard. 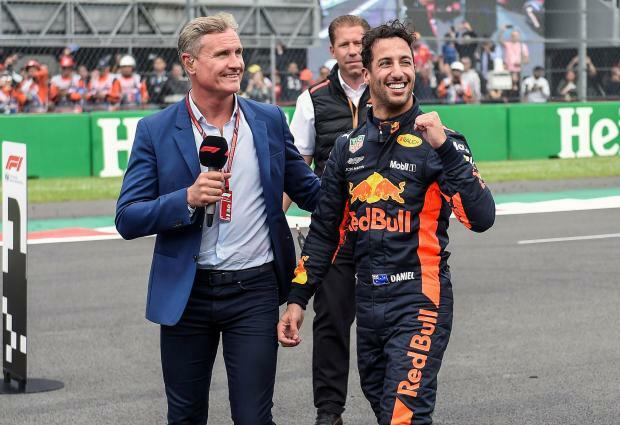 Daniel Ricciardo dashed Red Bull team mate Max Verstappen's hopes of becoming Formula One's youngest ever pole-sitter on Saturday while championship leader Lewis Hamilton qualified third for Mercedes at the Mexican Grand Prix. Hamilton, who need only finish seventh on Sunday to secure his fifth title with two races to spare, will have Ferrari rival Sebastian Vettel alongside on the second row. Vettel, 70 points behind Hamilton, must win the race to have any chance of denying the Briton. Last year's race winner Verstappen, 21, had dominated all three practice sessions and was fastest before Ricciardo produced a scorching effort at the high-altitude Hermanos Rodriguez circuit. The front row lockout was Red Bull's first since the U.S. Grand Prix of 2013 but second place still left the Dutch youngster feeling sore. Vettel, who had looked good for the front row before Ricciardo and then Hamilton pushed him down, said he had not managed to get a clean lap in. "I think we got more or less everything out of the car, dropping back to fourth from second is not satisfying but we'll see what we can do from there," he said. "We have good straight line speed so maybe that will help. We probably have the best reliability so far, the Red Bull's are fast so they will be hard to beat but they might beat themselves." Verstappen had an hydraulics problem in Friday's second practice while Ricciardo has endured seven retirements in 18 races so far. Hamilton's team mate Valtteri Bottas was fifth fastest, with Mercedes replacing his car's engine between final practice and qualifying, and ahead of fellow-Finn Kimi Raikkonen in sixth place for Ferrari. The Renault pair of Nico Hulkenberg and Carlos Sainz were seventh and eighth, with Sauber's Charles Leclerc and Marcus Ericsson filling the next row. There was disappointment for the Mexican crowd with the country's sole driver Sergio Perez qualifying only 13th.